American Staffordshire Terrier Dog Garden Planter in your favorite dog breed ~ the Amstaff! The Dog Garden Planter is the perfect outdoor accessory for the AmStaff Dog Lover - can also be used inside the home as well! 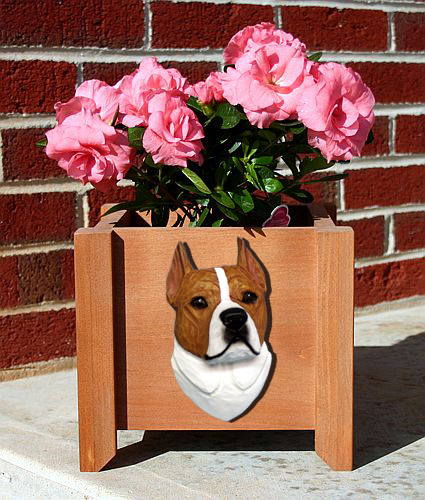 Our AmStaff Dog Garden Planter is made of pine and features a two-dimensional hand painted breed head. The overall size of the Garden Planter measures 9 1/8" x 9 1/8" x 8". The inside box measures 6 3/4" x 6 3/4" x 6 1/4" - holds a 6" pot nicely. The bottom of the planter is perforated for drainage and planter is sealed with a preservative to make it weather resistant. Great for display on the patio or by the front door. Made in USA. Dimensions:Overall Planter Dimensions: 9 1/8" x 9 1/8" x 8"
Inside box measures 6 3/4" x 6 3/4" x 6 1/4"
Material:Made of pine, the box is coated with a deck stain/sealer. Delivery Time:Orders placed after Sunday, Dec 2, 2018 may not arrive by Christmas.